Since Cosmo has allergies that cause itching and scratching, we were especially interested in what Dr. Campion had to say. We learned that IAMS worked closely with pet experts like animal nutritionists to develop these two new natural recipes to meet the needs of dog owners who either want a simply made dog food with highest quality ingredients or one that is carefully designed to address specific issues that may cause itching and scratching. TDWL: What exactly is Naturals. Is it organic? Dr. Campion: Naturals isn’t organic, AAFCO (Association Of American Feed Control Officials) created guidelines for pet food companies to use when developing “Natural” recipes. Only ingredients that have elements derived solely from plant, animal or mined sources can be included in a “Natural” recipe. All of the IAMS Naturals recipes, Simple & Natural, IAMS Sensitive Naturals and Healthy Naturals were developed using these guidelines. TDWL: How did you come up with the new recipes? Dr. Campion: Natural nutrition can make all the difference for many dogs whether they have ingredients sensitivities or just seem to thrive on a more simple recipe. 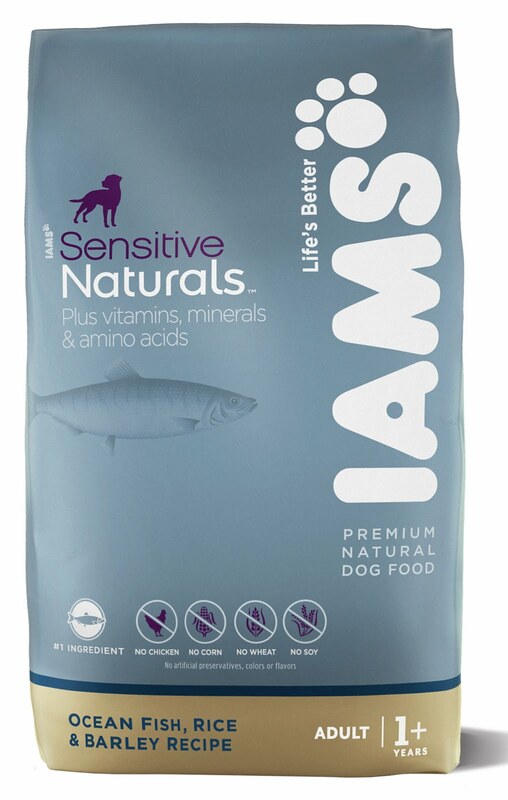 IAMS Sensitive Naturals is a specially formulated recipe designed to limit ingredients that may cause your dog to itch and scratch, while IAMS Simple & Natural is made with chicken as the number one ingredient and no corn, wheat, soy or meat by-products*. While these new products are designed for consumers with a more natural (vs. scientific) mindset, these products are fully consistent with our nutritional philosophy, where we are first concerned with enhancing the health and well-being of dogs and cats. For instance, IAMS believes that dogs and cats are best fed as carnivores, so the main source of protein in our new Naturals diet comes from animal sources (fish or chicken in this case). We also packed our new recipes with ingredients like vitamin E and other antioxidants for a strong immune system and prebiotics for digestive health. TDWL: When you say ‘ingredient sensitivities’ – do you mean food allergies? Dr. Campion: Well, only your vet can determine if your pet has food allergies. Many allergic reactions, such as excessive itching and scratching can be caused by sensitivities to certain ingredients. 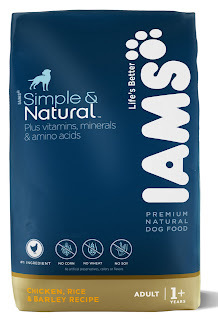 TDWL: What’s the difference between IAMS Naturals and IAMS Healthy Naturals? Dr. Campion: With the introduction of our new products, IAMS Healthy Naturals is now part of a larger “IAMS Naturals” family. The IAMS Naturals family includes two new products - IAMS Simple & Natural and IAMS Sensitive Naturals. IAMS Healthy Naturals continues to offer seven recipes (three for cats and four for dogs) for consumers looking to keep their pets healthy with ingredients they recognize like real chicken, fish, or lamb meal, wholesome grains, fruits, and vegetables. TDWL: What is the price point of the new recipes? Dr. Campion: All IAMS Simple & Natural and Sensitive Naturals have an MSRP of $11.99 for a 5-pound bag, $19.99 for a 10.5-pound bag and $38.99 for a 25-pound bag. TDWL: How should someone safely switch their pet from the food they’re currently feeding to this if they want their dog or cat to try it? Dr. Campion: Switching your dog to a new food takes some planning and should be done gradually. The most successful way to ease your dog into the change in diet would be to start by mixing 25 percent new food with 75 percent old food. Slowly change the proportions over the next three days or so by gradually increasing the new food and lessening the amount of the old food. At the end of this weaning process, you should be feeding 100 percent of the new food. To learn more about IAMS Naturals, visit www.Iams.com/natural or www.facebook.com/iams. All IAMS Naturals recipes are available at pet specialty stores, mass retailers and grocers. This is a very common problem for us that our pet dog sometimes does not follow and understand our commands so for solving this problem you can use this Dog Peer for getting trained your dog. Awesome Article, Really very informative posting which provide lots of informative in all the regards.thanks for the wonderful posting.